Poll Shows 64 Percent Of Americans Saying Afghan War 'Not Worth It' : The Two-Way This comes as Gen. David Petraeus, the top U.S. commander in Afghanistan, prepares to tell Congress today that there's been solid progress in Afghanistan and that U.S. forces can start to withdraw this summer, as planned. Three Afghan men on a motorcycle passed by as U.S. Marines patrolled last month in Afghanistan's Helmand Province. 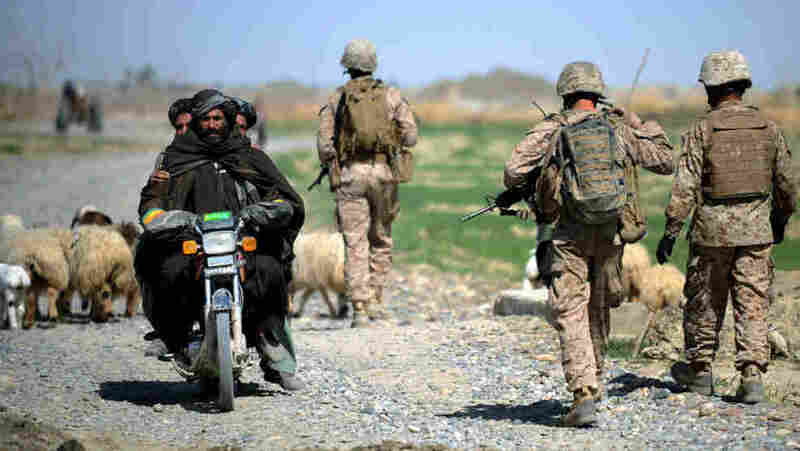 "Nearly two-thirds of Americans now say the war in Afghanistan is no longer worth fighting, the highest proportion yet opposed to the conflict," The Washington Post reports this morning. In a new Washington Post-ABC News, 1,005 adults were asked this question: "Considering the costs vs. the benefits to the United States, do you think the war in Afghanistan has been worth fighting or not?" In response, 64 percent said "not worth it," while 31% said "worth it." This comes as Gen. David Petraeus, the top U.S. commander in Afghanistan, prepares to tell Congress today that there's been solid progress in Afghanistan and that U.S. forces can start to withdraw this summer, as planned. Update at 11:25 a.m. ET: Petraeus' as-prepared-for-delivery statement for the Senate Armed Services Committee hearing is now posted here. "As a bottom line up front, it is ISAF's [the International Security Assistance Force] assessment that the momentum achieved by the Taliban in Afghanistan since 2005 has been arrested in much of the country and reversed in a number of important areas. However, while the security progress achieved over the past year is significant, it is also fragile and reversible. "Moreover, it is clear that much difficult work lies ahead with our Afghan partners to solidify and expand our gains in the face of the expected Taliban spring offensive. Nonetheless, the hard-fought achievements in 2010 and early 2011 have enabled the Joint Afghan-NATO Transition Board to recommend initiation this spring of transition to Afghan lead in several provinces." "Although the insurgents are already striving to regain lost momentum and lost safe havens as we enter the spring fighting season, we believe that we will be able to build on the momentum achieved in 2010 — though that clearly will entail additional tough fighting."